Mon., May 15, 2017, 11:23 p.m.
Zaza Pachulia’s foul on Kawhi Leonard was either dirty or just dangerous, and Gregg Popovich isn’t interested in the NBA’s opinion. Popovich ruled Leonard out for Game 2 of the Western Conference finals, but the debate about the play that caused his injured left ankle raged on long after Leonard crashed to the floor in pain Sunday. The play that knocked Leonard out of the game and helped Golden State’s huge rally in Game 1 of the series is one the NBA started cracking down on four seasons ago in an effort to protect jump shooters. And more protection is the last thing shooters need, Cleveland guard Iman Shumpert said. “Trust me, we don’t need the league putting in any more fouls and advantages for offensive players. We don’t need it. That’s something I think, if you take a contest out of the game, come on,” he said. But with long-distance shots playing such a heavy role in offenses these days, the risk of injury isn’t going away. “We see this quite often in the NBA where that defender, they just go a little too far and you’re not allowed to take the landing area away from the jump shooter,” Joe Borgia, the NBA’s senior vice president of replay and referee operations, said Sunday while discussing the foul that was called on Pachulia on his “Making the Call” video segment on NBA.com. 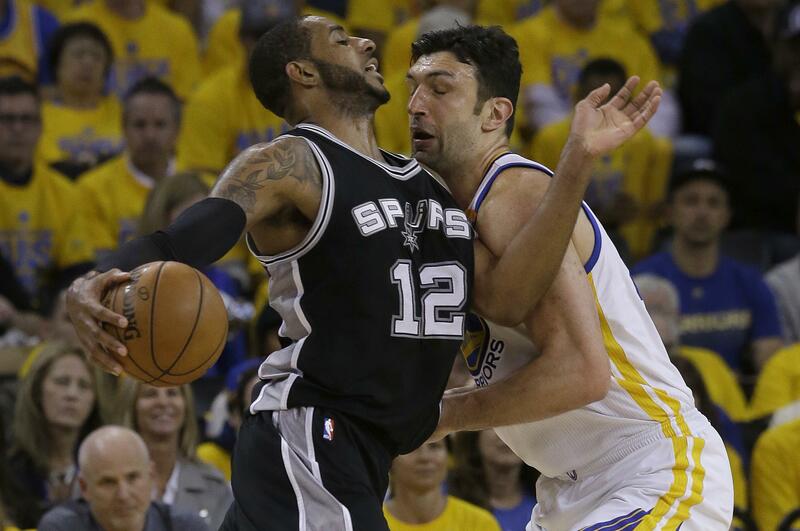 That wasn’t enough for ABC analyst Jeff Van Gundy, who argued that Pachulia should have been called for a flagrant one for intentionally sliding under Leonard, which both players denied. Leonard is respected for the way he defends without fouling, but opponents hated the way former Spurs defensive ace Bruce Bowen crowded too closely on their jumpers. Pachulia said he was just trying to contest the shot and seemed surprised at first that a foul was even called, though many observers on social media thought the play looked suspect. “Zaza’s not a dirty player. You’ve got to time that perfectly if you want to hurt somebody,” teammate Kevin Durant said. “We’re not that type of team. Kawhi’s an unbelievable player. We’ve got nothing but respect for him. We wish that he gets healthy. … I wish it didn’t happen, but I don’t think it was intentional. But they aren’t the only ones lately wondering if one of those fouls was intentional. Markieff Morris did the same after the Washington forward landed on Al Horford’s foot in Game 1 of their Eastern Conference semifinal, knocking him out of a game the Celtics rallied to win. Realizing the potential for ankle injuries – a problem for Warriors star Stephen Curry earlier in his career – the NBA made the play one of its points of emphasis for officials before the 2013-14 season, stressing that shooters had to be given the freedom to land. But in a series like the West finals, matching the Warriors’ lethal outside shooters against a Spurs team that led the league in 3-point percentage during the regular season, neither team is going to want to allow too much space. That’s all Pachulia had in mind. Published: May 15, 2017, 11:23 p.m.